It’s been almost three months since my last recipe (the baked trout posted on January 18th). No worries, I did not forget about this site! As some of you may know, over the past four years I’ve been working on my Ph.D. in Aerospace Engineering at the George Washington University in Washington, D.C. Well, the time has come for me to graduate. The deadline to defend and submit my dissertation was April 1st and it was definitely a huge push to get everything done in time (just ask my gf, I think she was more excited about me finishing than me). But finally, it’s done! I am still waiting on my status to officially change to “degree awarded” but once that happens, I’ll be done with school, for ever (I hope). To celebrate being done, I decided to bake one of my favorite Slovak pastry-shop cakes called punčové rezy. This translates to punch slices. Now, I don’t claim to be a great cook, but I am definitely a better cook than a baker. One of my goals for this this year is to get better at baking so you will see a lot of cakes coming up. Sometimes they will turn out better than other times. This one is in the so-so category. I blame too many eggs. The recipe I followed did not specify the size of the eggs, and I, without even thinking about it, used large eggs. The resulting cake has bit of a consistency of a quiche, not the crumbly, melt-in-your-mouth texture I anticipated. Hence, when you do this cake, either use small eggs, fewer eggs, or more flour. I weighed all my ingredients on a kitchen scale but also included volumetric measurements. These come from online convertors, so I don’t guarantee their accuracy. 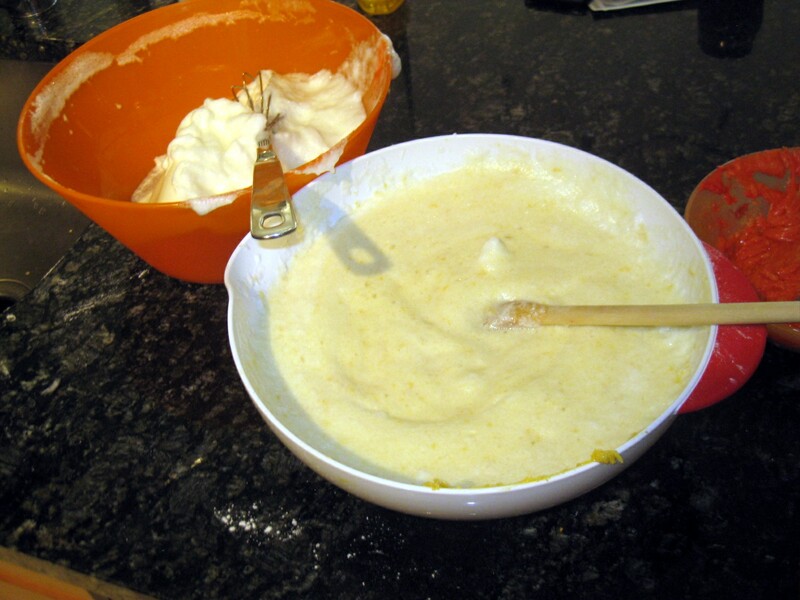 Also, you may want to divided the dough ingredients into two groups: one containing 2/3 of the total amount, and the other containing the remaining 1/3. 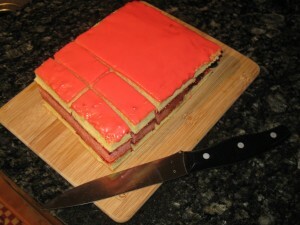 This is because you will be baking 3 layers, one of which is red. I did this “by eye”. 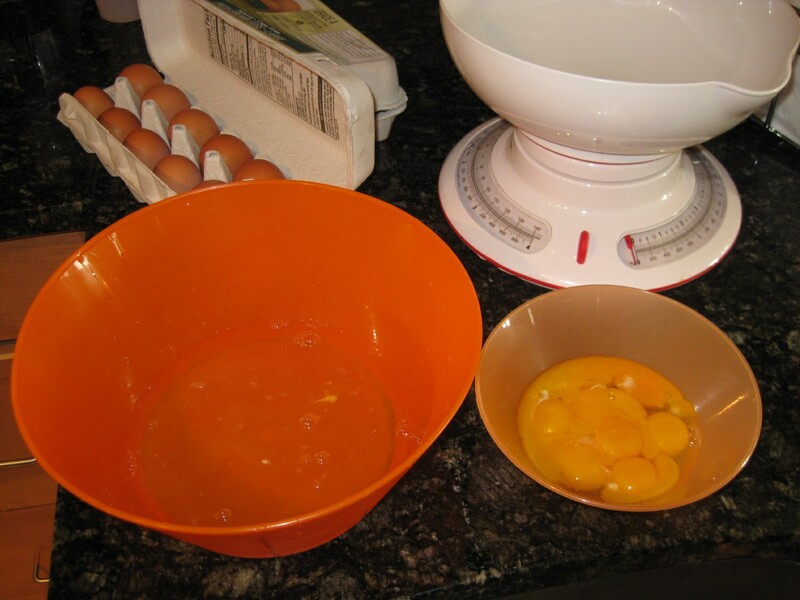 Start by separating the yolks from the whites. 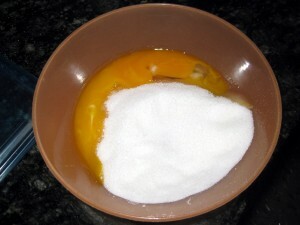 Add 200g (1 cup) sugar to the yolks. Whisk the yolks (this is delicious!) and gradually mix in the flour mixed with the baking powder. You will end up with a “Nilla wafer” dough, piškótové cesto. Next, separate (approximately) one third of the dough into a separate container. 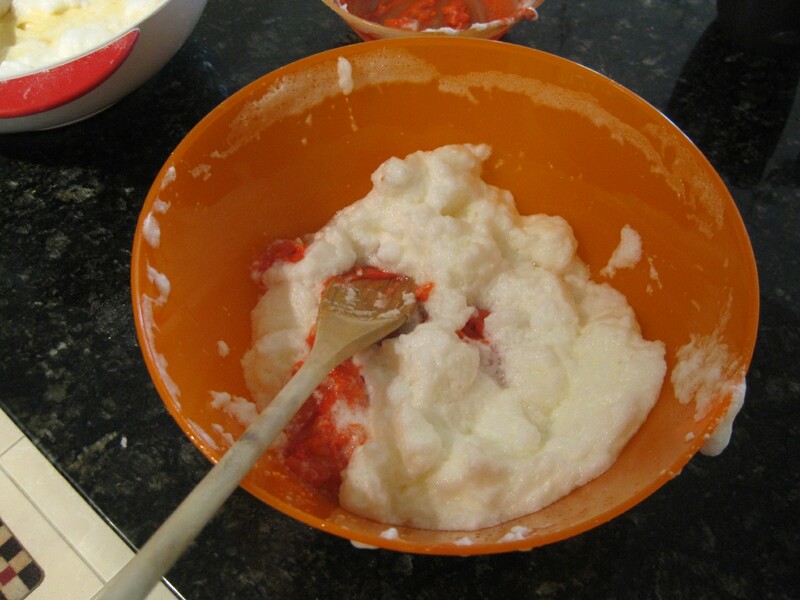 Mix in few drops of red food coloring. You can also alternatively separate the yolks prior to adding flour and mix in the color. Whisk the remaining sugar with the egg whites until you get stiff peaks. 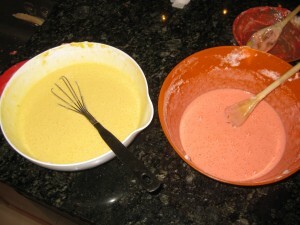 Gradually mix in two-thirds into the yellow dough and the other one-third into the red dough. You will end up with a liquid dough. 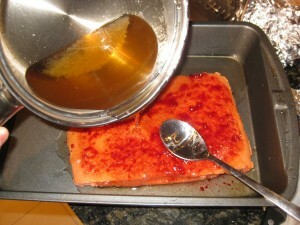 Next line a deep baking pan with parchment paper or grease well with oil. Use a pan bigger than 11x7x2 which is unfortunately all I had available. This gave me a cake that was too tall. Bake the yellow dough first. The recipe I followed did not specify the time or temperature so I baked at 350F for about 30 minutes, until the inside was done. Cut the yellow dough into two halves. 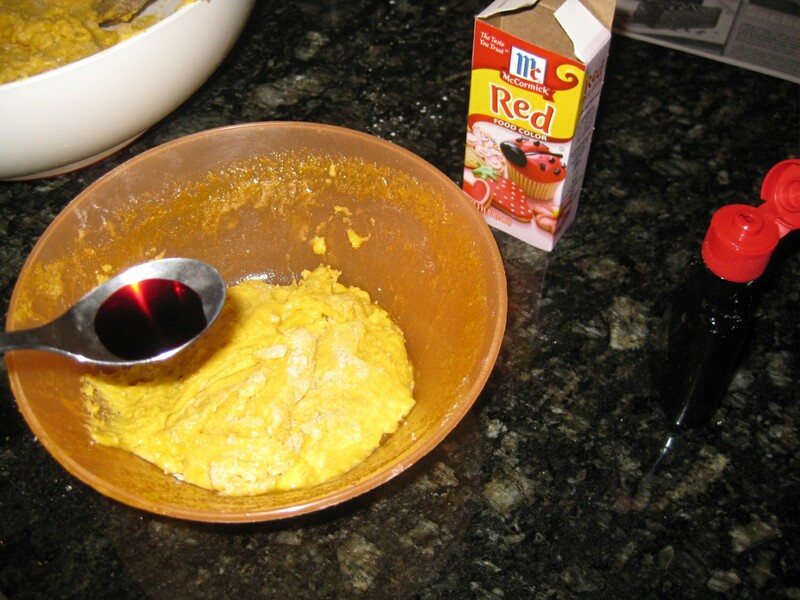 Next bake the red dough. I constructed a “half-pan” that matched in size one of the yellow layers. While the dough is cooling, prepare the punch syrup. Mix the sugar with water and cook until the mixture becomes liquid. Let cool (be careful this liquid is very hot even when not bubbling!) 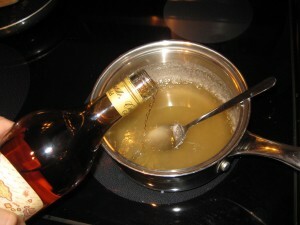 and mix in enough rum to make it tasty and liquid. I used about one cup. Then soak the red layer in this punch. 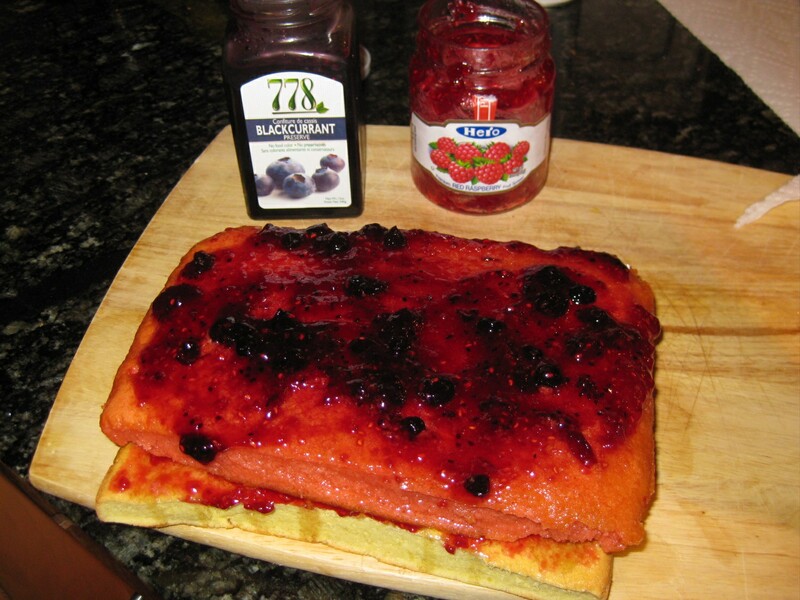 Join the individual layers with a jam of your choice. I used a mixture of raspberry and black currant. Drip the remaining syrup over the top yellow layer. Cover, weigh down, and let sit for at least 12 hours in a cool place. Prepare the icing once the cake sets (the next day). 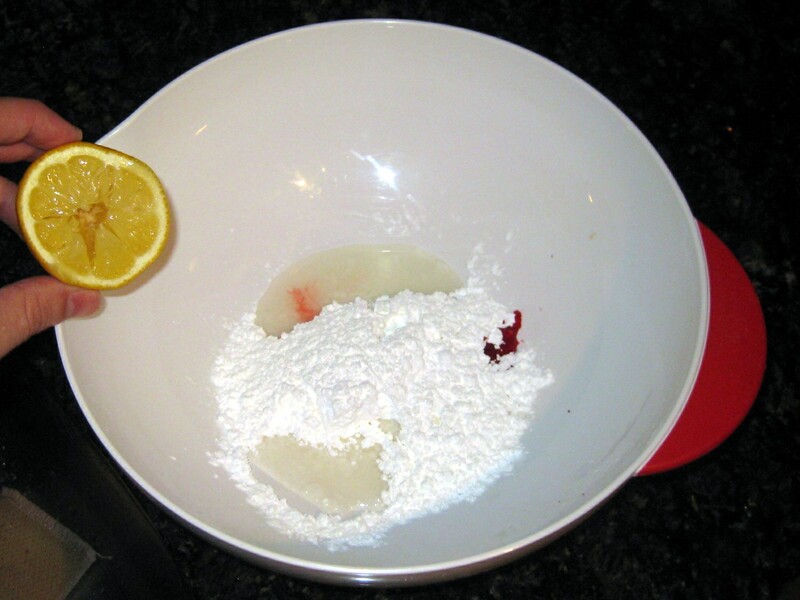 Blend the icing sugar with the hot water, few drops of red food coloring, and one half of a squeezed lemon. Spread the icing on top and again let set. Finally cut with a wet knife. Enjoy! 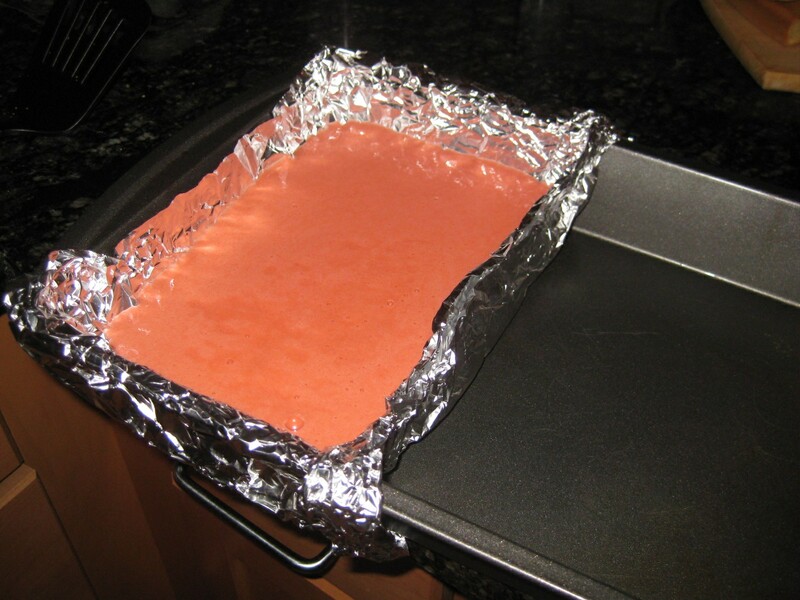 My cake ended up quite dry and thick, sort of like Nilla wafers. I suspect this was due to not enough flour / too much egg. Hopefully you’ll have more luck with yours. Have fun! Luboš, k úspešnému ukončeniu štúdia Vám srdečne blahoželám. Punčové rezy sú na oslavu veľmi vhodné a “dôstojné”. Na webe je niekoľko spôsobov prípravy punčákov. Stredný korpus sa zvyčajne farbí až po upečení malinovým sirupom alebo rozvareným džemom. Tie Vaše vyzerajú lákavo. 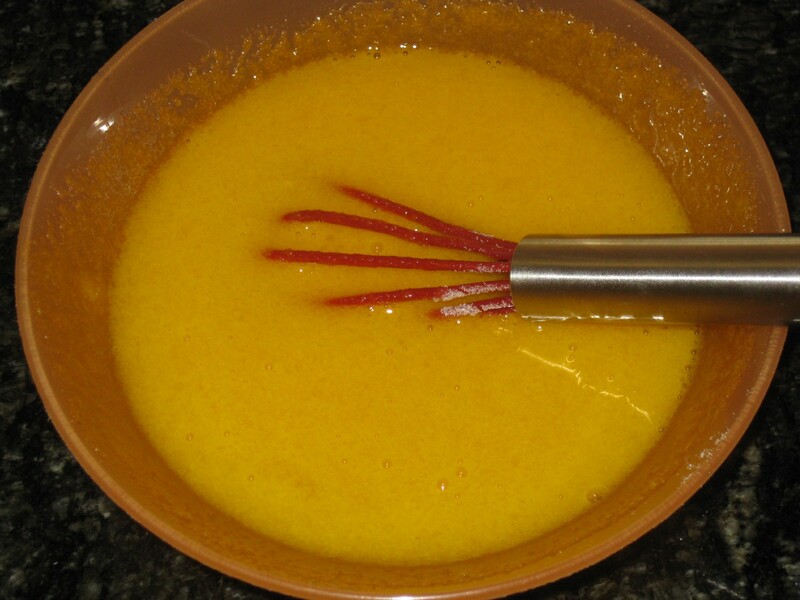 The recipe in The Czechoslovak Cookbook by Joza Brizova uses 6 eggs. Anyway, thanks for posting and congratulations on finishing your degree. Vesetko najlepsie! great post. it is very helpful for people. i will tell my other friend to visit that site for there help. thanks for the nice recipe. I have wandered into many a Slovak pastry shop and seen this little cake. I always wondered what it was, and unfortunately my Slovak is good enough to ask, but likely not good enough to understand the answer. Now I’ve been educated! Lubos, you saved the day again. Cau Petra, I know exactly what you mean. But here in the USA, flour doesn’t come in different grinds the way it is sold in Slovakia. I actually did a little experiment on flour types a while back exactly for this reason. 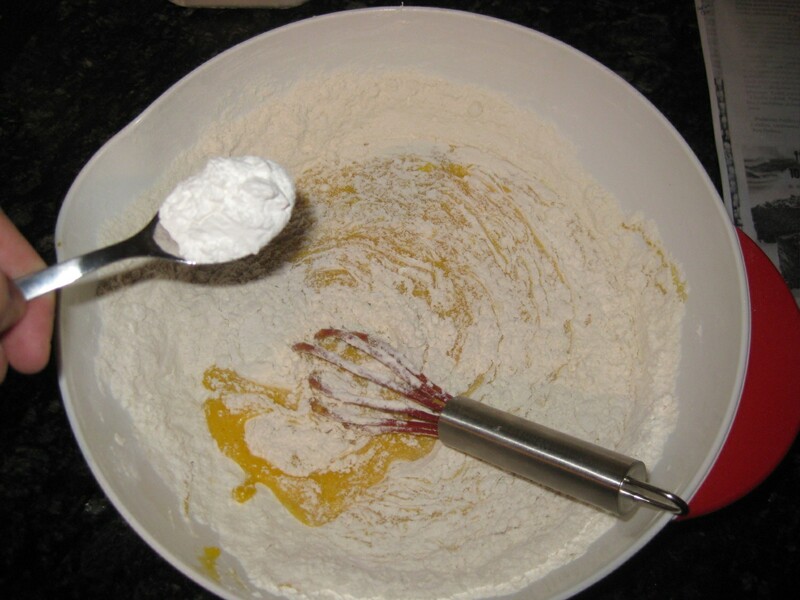 Flour in the US is differentiated mainly by the type of grain (i.e. whole wheat flour, rye, “white” wheat flour). There are also few types for specific purposes, there is bread flour which has a higher protein content. There is also something called cake flour, which I am suspecting may be similar to the Slovak “fine grind”. But I have never used that one. I use all-purpose flour in all my baking, except for breads, where I use a mix of whole wheat and rye. This particular cake was made with the Pillsbury Gold Medal All Purpose. your site is great. I love to see the varieties of traditional food and it is also helpful to have it translated. 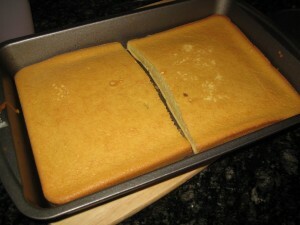 Puncove rezy (or tea-rum cake, as I call it) is one of the favorite desserts in my family. Since I am often asked to bring it to the parties, I had to come with the faster solution (Lazy tea-rum cake) and I wanted to share it. I buy frozen Sarah Lee pound cake (fresh is too sweet and sticky and frozen part is important). 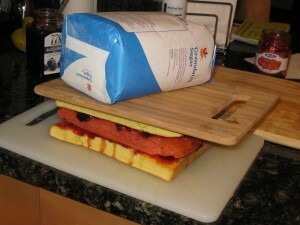 Let it defrost only partially, just to be able to slice it across 2 times in order to obtain 3 layers. While is defrosting make a strong black tea with rum and some blackcurrant or raspberry syrup. 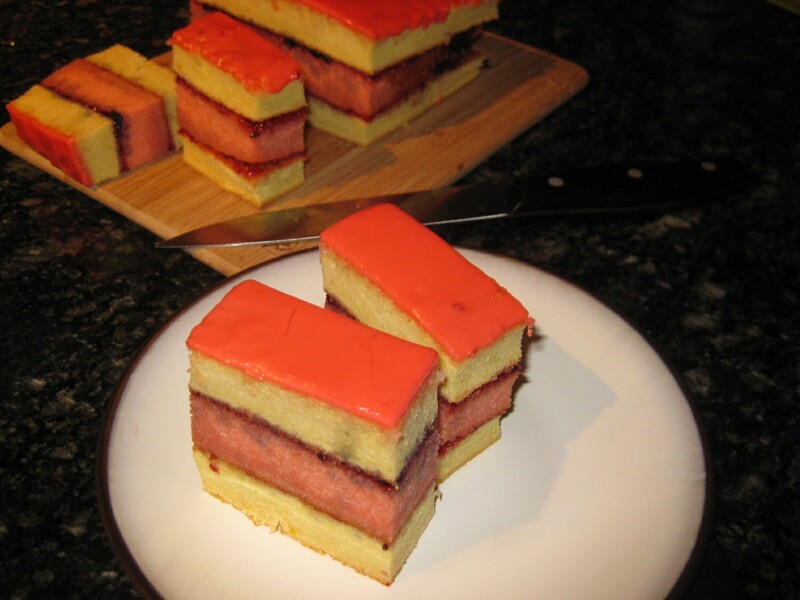 Cut the middle layer into 1-1.5 cm cubes, cover with slightly warm tea and add little bit of raspberry jam, mix lightly with a fork. Spread the jam also on one side of the two other layers. I like to see the cubes in the sliced cake, that’s why partially frozen is important. If higher cake is desired, Nilla wafers could be dipped into the rum tea and put on the first layer on the top of jam, then add the filling and last layer with the jam side down (touching the filling). Make the icing, let harden and enjoy. Thanks again for your site.